Jeff Sessions, a racist bloodhound, is considering indefinite detention of people who cross the U.S. border seeking asylum. 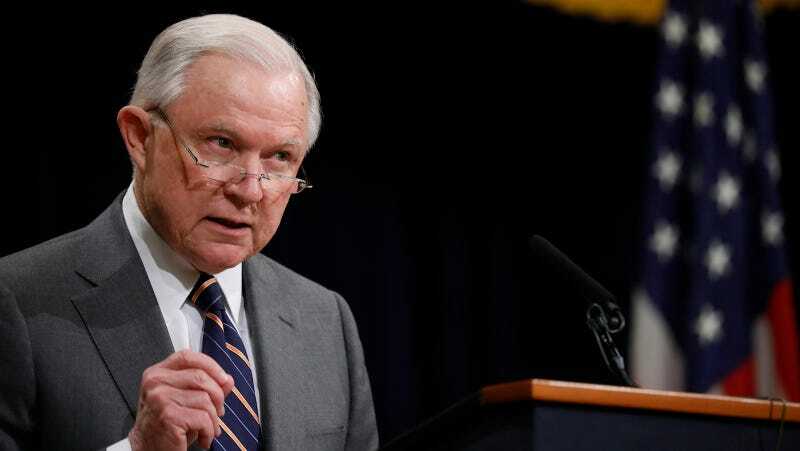 Over the past several months, Sessions has instructed judges to deny victims of domestic and gang-violence asylum, and now he is reportedly considering to deny bond hearings to asylum seekers, even if they have passed the credible fear interview. This means that anyone seeking safe haven in the U.S. could be detained indefinitely. A decision set by a case called Matter of X-K, the Board of Immigration Appeals (BIA) allows asylum seekers to be released on bond if they pass a “credible fear” interview, in which officials assess whether the asylum seeker is at risk of persecution in their home country. Sessions is reportedly trying to find a way to overturn the BIA’s decision. Immigration lawyer Ginger Jacobs told San Diego station KPBS that, as a result, asylum cases are becoming harder to win. “We’ve seen him do this now with about a half a dozen cases — he’s starting to pick up speed in going through these cases and referring them to himself so he can basically assert his interpretation of the law,” Jacobs said of Sessions. Meanwhile, the administration is also trying to undo a 1997 agreement known as the Flores Settlement, which requires ICE to release minors as quickly as possible, and provide them with basic, humane living standards in the meantime. Upending the Flores Settlement means that ICE could detain children and families indefinitely with even less oversight and transparency than it currently has.